A thunderstorm above Unna, in Germany. Credit: smial/Wikipedia. The research forecasts a 15 per cent drop in the average number of lightning flashes worldwide by the turn of this century, if global temperatures are in the top range of forecasts. A drop in the incidence of lightning strikes could impact on the frequency of wildfires, especially in tropical regions. It could also lower the incidence of lightning strikes to infrastructure and affect how greenhouse gases in the atmosphere contribute to climate change. 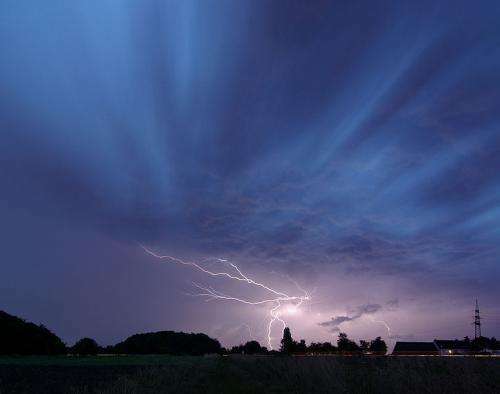 Scientists from the Universities of Edinburgh and Leeds and Lancaster University used a newly devised method to calculate the likely incidence of lightning flashes from storm clouds. Unlike traditional calculations of lightning flashes at the global scale, which are based on the height of clouds, their approach takes into account the movement of tiny ice particles that form and move within clouds. Electrical charges build up in these ice particles, and in cold water droplets and soft hail formed inside clouds. These are discharged during storms, giving rise to lightning flashes and thunder. Scientists estimate there are 1.4 billion lightning flashes each year around the world. The latest results, accounting for a 5C rise in global average temperatures by the year 2100, show that on average lightning flashes are less likely in future, in contrast to previous studies. Scientists previously verified their method by applying it to current conditions. The research, published in Nature Climate Change, was funded by the Natural Environment Research Council. Dr Declan Finney of the University of Leeds, formerly of the University of Edinburgh, who carried out the study, said: "This research questions the reliability of previous projections of lightning, and encourages further study into the effects of climate change on cloud ice and lightning." Professor Ruth Doherty, of the University of Edinburgh's School of Geosciences, said: "This research expands our current knowledge of climate change impacts on lightning and suggests that in a warmer world, the incidence of lightning is likely to decrease." Professor Oliver Wild, Of Lancaster University, said: "The results provide new insight into the likely impacts of lightning on future atmospheric composition and climate." Too bad this paper is behind a paywall. A 15% decrease in the next 82 years! Hells bells is this counter intuitive. Does this include sprites and EVLES? Being that hurricanes and extreme weather are the general consensus of GW advocates how could such a contrarian projection be made? No GW gloom and doom here. "This research questions the reliability of previous projections of lightning, and encourages further study into the effects of climate change …" This is the mantra of an academic exercise. Being this goes out of the mainstream GW scenario forget any funding for future study. No indication in the article as to what findings these researchers base this estimated decline upon. Needless to say, the prediction and/or claim is certainly counterintuitive, and, lacking any insight into the process they claim will bring about this reduction, this article goes into the ground file. Being that hurricanes and extreme weather are the general consensus of GW advocates how could such a contrarian projection be made? No GW gloom and doom here. Being this goes out of the mainstream GW scenario forget any funding for future study. Which relies wholly upon further numbskullery to proceed from premise to conclusion. Humm, how many thunderstorms do we see in the winter? Humm, how many thunderstorms do we see in the summer? No waste of grant money here is it? With both the Earth's and the Sun's magnetic fields weakening we are likely to see much more cosmic ray activity, and in turn more lightning among other things.